Ashwin and Shardul then showed some resistance to take their side past the 350-run mark. The West Indies are on the verge of yet another defeat as they were tottering at 76/6 at tea on the third day of the second cricket Test against India at the Rajiv Gandhi International Stadium here on Sunday. The visitors now have a slender lead of 20 runs. They were dismissed for 311 runs in their first innings while the Indians posted 367 in their first essay. India, who had won the first Test by an innings and 272 runs, are well on their way to a clean sweep of the two-match series. Fast bowler Umesh Yadav did most of the damage with figures of 3/32. The pacer, who had figures of 6/88 in the first innings, has nine wickets so far in this match. The spin trio of Ravichandran Ashwin, Ravindra Jadeja and Kuldeep Yadav picked up a wicket each. Earlier, riding on some top-class bowling, the West Indies wrapped up India at 367 runs in their first innings. Resuming the third day at 308/4, the hosts lost five wickets in quick succession before Ravichandran Ashwin (35) and Shardul Thakur (4 not out) added 28 runs for the last wicket. Pacer and skipper Jason Holder returned with excellent figures of 5/56 as he broke down the India lower middle-order. Ajinkya Rahane (80) fell early in the morning session after adding just five runs to his overnight score. Holder then dismissed Ravindra Jadeja on a duck, while pacer Shannon Gabriel packed back a well settled Pant (92) to leave India reeling at 322/7. Kuldeep Yadav too fell cheaply to a Holder delivery after contributing just six runs while Umesh Yadav (2) also failed to score as India’s scorecard read 339/9. Gabriel finally performed the last rites as he bowled out Ashwin as India managed to take a 56-run lead in reply to West Indies first innings total of 311 runs. 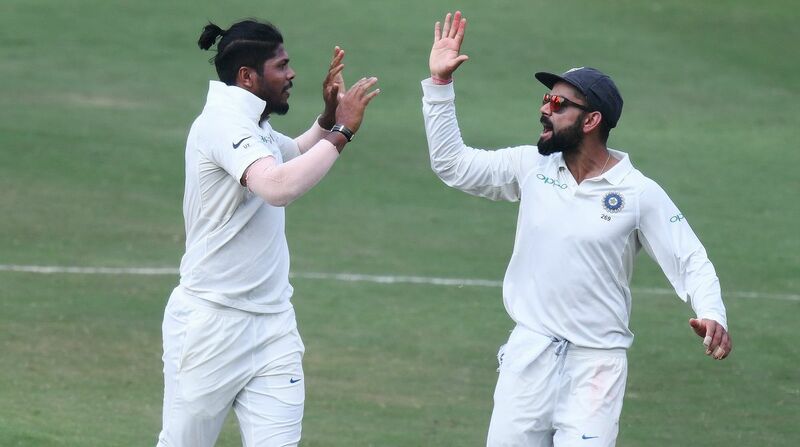 West Indies: 311 and 76/6 (Shai Hope 28; Umesh Yadav 3/32) lead by 20 runs vs India: 367 in first innings (Rishabh Pant 92, Ajinkya Rahane 80; Jason Holder 5/56).